The Enterprise stops by the mysterious planet Omicron Theta, where Data was discovered more than 20 years earlier. Riker leads an away team and finds a planet devoid of life — and a secret chamber near where Data was found. The chamber (which wasn’t found with Data originally) contains a lab where our heroes find the components of an android identical to Data and piece together (TOS-exposition style) that the reclusive scientist, Dr. Noonien Soong, must have built both androids there. Back on the ship, the Enterprise crew puts the other android together, and he tells them his name is Lore. Lore is much more human than Data and incapacitates his “brother” in order to take his place and summon a “crystalline entity” — essentially a giant snowflake (in space!) that eradicated the colony — to attack the Enterprise. Wesley does his boy-genius thing and figures out that Lore is impersonating Data, which should have been pretty obvious to the adults. After the bridge crew tells Wesley to shut up about 10 times, he gets his moms to turn Data on (Not in that way! This isn’t “The Naked Now“) and the three of them stop Lore, by beaming Lore into space. The introduction of Lore and Data’s background is hugely important. It’s a key point in “The Measure of Man”, one of the highlights of TNG. In the third season episode “Brothers”, we learn Soong is still alive when he summons Data (and, inadvertently, Lore) with a homing signal. At that point, Lore steals an emotion chip meant for Data, kills the elderly Soong in the process and escapes. He later uses the emotion chip to help a group of Borg separated from the collective by the Enterprise’s actions in “I, Borg”, becoming a sort of cult leader (in “Descent, I and II”). After temporarily turning Data in those episodes by using the chip, Lore is defeated by the Enterprise crew and deactivated, ending the threat to the Federation. Data later employs the emotion chip in “Star Trek: Generations”, which complicates the investigation of a Romulan attack at the Amargosa Observatory. A cowering Data, overcome by emotions, allows Dr. Tolian Soran to escape, which leads to Picard’s efforts to stop Soran on Veridian III with the help of James Kirk. Kirk had been consumed by a time-traveling event (called the Nexus) during the maiden voyage of the Enterprise-B 78 years earlier, in the opening of that film, and dies shortly after the confrontation with Soran. 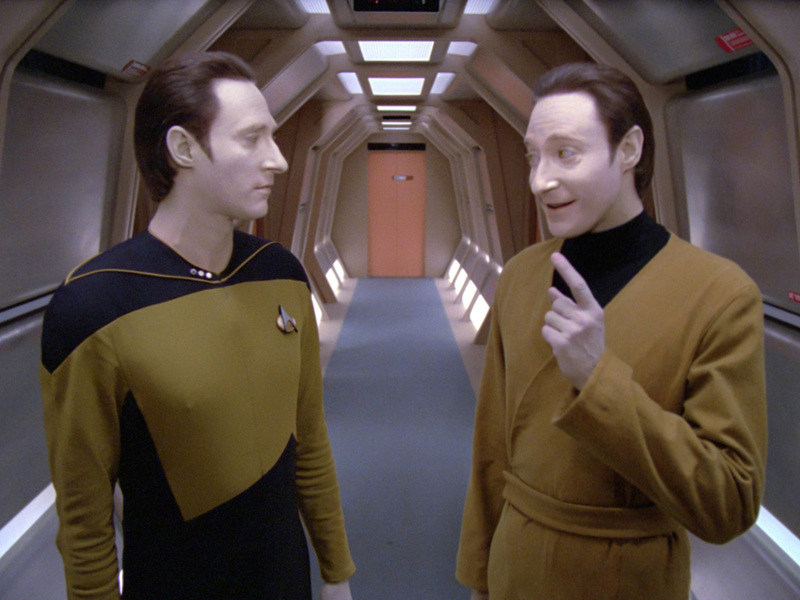 Data, as the movie ends, has adapted to the emotion chip and has emotions (more or less) in the next three films. Soong’s research also led to the construction of the prototype android B-4, which Romulan Praetor Shinzon uses in an elaborate trap to attack the Federation and capture Picard in “Star Trek: Nemesis”. We also learn about Soong’s family in the Augments trilogy during the fourth season of “Star Trek: Enterprise.” Arik Soong, an ancestor of Noonien Soong, began down the road of cybernetics after he deemed genetic engineering (based on the work that led to Khan and others in the 20th century) hopeless. Brent Spiner, naturally, played Arik Soong. We also see the crystalline entity again in “Silicon Avatar”, Data’s “mother” Juliana Soong (who was on the colony and escaped with Soong before it was destroyed) in “Inheritance”, and learn more about Soong and androids in several other episodes. 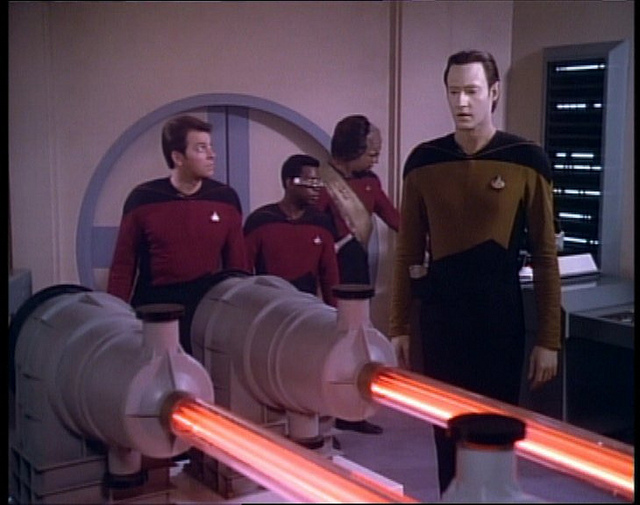 Generally speaking, exploring Data’s origins and capabilities was a major piece of TNG, and it really began with “Datalore”. This episode suffers from some first-season issues. How Data — who presumably would have done research on androids to learn more about himself — wouldn’t have heard of Soong, and how Riker, Geordi and Yar (!) would have (as shown during the lab scene) is hard to swallow. Beyond that, Data being so uninvolved in Lore’s activation was weird. It’s almost as if Data knew very little about androids — which makes almost zero sense, especially based on what we see later (like when he BUILDS an android in “The Offspring”). This would be like if Worf, who grew up separated from his origins, knew very little about Klingons — despite a strong interest in his origins. Wouldn’t Data have come across the name Noonien Soong in research on androids? Remember, this is an android who remembers everything he reads and can consume information at ridiculously fast speeds. Moreover, it’s never made a ton of sense that Data spent more than 20 years in Starfleet (at Starfleet Academy and before his posting on the Enterprise) not learning more about himself (and why he’s still so unhuman/android-like by the time we meet him). It’s always been puzzling why the creators set Data’s discovery so far back in the Star Trek timeline. 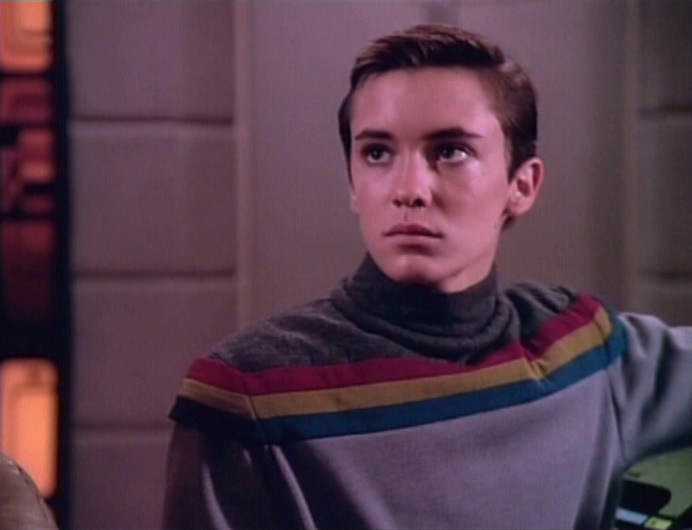 It sort of sets up his ascendancy through Starfleet to where he is a fairly high-ranking officer. But we know other characters — Riker and later La Forge — reached the rank of lieutenant commander in significantly less than 20 years. Riker was actually offered his own command less than 10 years after he graduated from the academy! Back to this episode, there’s also the really annoying stuff with the bridge crew and Wesley. Wesley could have been more persuasive and Picard and Co. could have been FAR less dismissive. Wesley Saving the Day was an annoying trope in the early seasons mostly because of the execution of HOW he usually saved the day. Wesley spotting Lore as Data could have been pulled off in a much more believable method. — Humiliated after failing to build an android with a positronic brain, Soong (with his wife, Juliana, we learn later) moves to the remote Omicron Theta. While there, the two begin construction of androids, Lore, Data and prototypes including B-4 — who must have been stored elsewhere in Soong’s lab as the away team doesn’t find him, but Shinzon apparently does prior to the events of “Star Trek: Nemesis”. I guess the Enterprise crew was in a hurry/not very thorough? — Lore is completed and alive for a while on the colony, but his emotions make him “twisted and cruel.” The colonists feel threatened by him. — Soong decides to build an android without emotions (Data) and (at some point) decides to deactivate Lore. Before being disassembled, Lore contacts the crystalline entity, which destroys the colony, but not before Data is left outside (after Soong provides him with the colonists’ memories) and Soong and Juliana escape. I’ve never understood how this sequence of events is possible, considering how efficient the crystalline entity is with its methods in “Silicon Avatar”. A colony of 400 or so people MIGHT have had a few hours to do anything before it was destroyed, unless something seriously slowed the entity down. We’ll begin with the conceit that Data was under construction — perhaps near completion — BEFORE Lore was deactivated. Otherwise, there would have been no time for Soong and Juliana to build and test Data (there are lines of dialog in “Inheritance” about extensive testing) and disassemble Lore. Then, you figure that as Data’s being completed, Lore contacts the entity — which might have been what finally prompted Soong to deactivate him. That makes sense if Soong learned of the communication well before the entity arrived, especially if he didn’t understand what the entity was capable of doing (or what, exactly, Lore contacted). Otherwise, why stay on the planet? Why not warn the other colonists? And, of course, how did Lore find out about the crystalline entity in the first place? Shortly thereafter, Data is completed. Then, presumably, the entity arrives and scares the colonists enough that children draw pictures of the thing. Soong hurriedly uploads the colonists’ journals into Data, puts him on the stoop, possibly creates the hidden lab door (although that could have been done earlier) and escapes with Juliana before the colony gets destroyed. Lore (and B-4, presumably) are left in storage at the lab. It just might work — if we didn’t know that the entity does its thing efficiently and should have made quick work of the colony. Or, if we knew what delayed it. Maybe it hovered for a while trying to find out what happened to its BFF Lore, but I sort of doubt it. It’s also odd that Lore, in this episode, knows that the entity was successful, even though he was on a shelf during the attack. I guess he just… pieced it together? Other than that last note, we’re addressing continuity/logic problems that mostly aren’t the fault of “Datalore”. But it’s unlikely that we’ll review some of the episodes that cause issues with this one — so it makes sense to do our analysis here. Back to this episode, Lore’s plan after he’s reactivated is sort of odd. Did he think the entity could remove all life on the Enterprise — leaving him (and maybe Data) as the only survivors? Or, did Lore figure he could somehow travel with the entity after the Enterprise was destroyed? The second option makes more sense, otherwise, Lore would have needed an escape plan when he drew the entity to the colony in the first place. Maybe he figured he could escape on the shuttle Soong used to escape? Oh, and, finally, why did the Enterprise crew simply leave Lore floating in space? They had to know where he was. Couldn’t they have beamed him aboard and put him somewhere where he could do no harm? That certainly would have prevented some problems later (see above). OTOH, it’s odd that Picard, with his very real respect for life, wouldn’t have tried to save Lore. This is another step toward TNG’s improvement during the first season. The series was remarkably stronger after the first 10 episodes or so — even if it wasn’t quite as good as it would be in the third and fourth seasons. Still, “Datalore” is somewhat campy, employing the “evil” version of a main character and using some B-movie camera angles and music. And Data’s final line to Picard, where he uses a contraction (like Lore) and has a facial twitch (like Lore) was sort of a cheap in-joke. Was it actually Lore who survived (thunderclap)? It WAS Lore who survived and now he’s taken over the Enterprise and turned Wesley into a torch! Just kidding — we’ll see some Klingon stuff, or something.